Discovery Notes The sample was collected outside the city limits of Monroe at the opening of a livestock barn. The sample was collected 1/8th of an inch below the soil surface and the temperature was approximately 21.7 degrees celsius. Sequencing Notes There was 1 deletion present in 10% of this phage population. Deletion 1 is 180 bp long, and is between positions 2329 - 2508, inclusive. At position 3288, 42% of reads have a C rather than consensus T. At position 24258, 25% of reads have a G rather than consensus A. At position 24330, 42% of reads have an A rather than consensus G. At position 25071, 29% of reads have an A rather than consensus G. At position 44550, 32% of reads have a T rather than consensus C. Between 44984-44985, 42% of reads have a T addition. 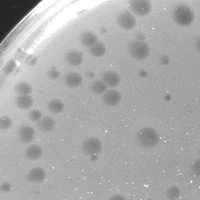 Plaque Notes This phage expresses three sizes of plaques including 1mm,2mm and pin prick. The plaques are circular, turbid and present halos.